Winds notched up to 65 miles per hour in Florida, where more than 100 people were pulled from ocean waters because of riptides. The Weather Channel's Jim Cantore reports. Updated at 12:34 a.m. ET: -- Tropical Storm Beryl began to make landfall early Monday, bringing heavy rain and high winds to northeast Florida, Weather Channel meteorologist Mike Seidel said. The center of the second named storm of the 2012 Atlantic hurricane season moved ashore near Jacksonville Beach at around 12:10 a.m. EDT, the National Hurricane Center said. The estimated intensity of Beryl at landfall was 70 mph. Prior to landfall, a National Oceanic and Atmospheric Administration station in Mayport, Fla. reported sustained winds of 44 mph and a wind gust of 59 mph. Earlier Sunday, Gov. Rick Scott urged Florida residents in the affected areas to "stay alert and aware." The powerful pack of thunderstorms prompted tropical storm warnings along the coast in northern Florida, Georgia and parts of South Carolina, disrupting Memorial Day weekend plans for some beachgoers and travelers. Beryl was expected to bring 4 to 8 inches of rain to parts, with some areas getting as much as 12 inches. Forecasters predict the storm surge and tide will cause some coastal flooding in northeastern Florida, Georgia and southern South Carolina. Campers at Cumberland Island, Fla., which is reachable only by boat, were told to leave by Sunday afternoon. The island has a number of undeveloped beaches and forests popular with campers. Tropical Storm Beryl has residents in Georgia and Florida bracing for drenching rains and driving winds. The Weather Channel Mike Seidel reports. However, many people seemed determined to make the best of the soggy forecast. At Greyfield Inn, a 19th-century mansion and the only private inn on Cumberland Island, the rooms were nearly full Sunday; all guests were planning to stay put through the wet weather, said Dawn Drake, who answered the phone at the inn's office on the Florida coast. In Jacksonville, Fla., Mayor Alvin Brown ordered a state of emergency, ending the Jazz Festival early and urging people to stay out of the water and off the streets, News4JAX.com reported. Workers are also out clearing tree limbs and debris that could be tossed about by the storm's winds. "We are encouraging all residents to stay indoors," Brown said at a Sunday morning news conference at the Emergency Operations Center. 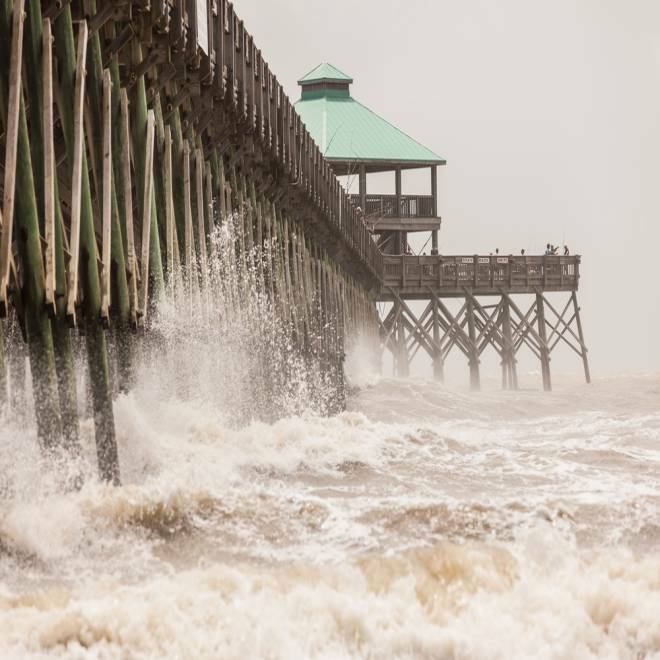 Strong waves batter Folly Beach Pier as Tropical Storm Beryl brushes past the South Carolina coast on Sunday. But business was booming at the Red Dog Surf Shop in New Smyrna Beach, Fla., where customers flocked to buy boards and wax in anticipation of the storm's high waves. Officials all along the coast warned of rip currents, waves and high tides — all of which can be dangerous but also tend to attract adventurous surfers. The waters had already become dangerous in South Carolina, where rescuers were searching for a missing swimmer. In Jacksonville Beach, Fernando Sola said business was booming at his Happy Faces Ice Cream truck. A bus- full of tourists from South Carolina had stopped to buy some ice cream and watch the storm waters churn. "There are actually more people than on a normal day. It's working out great," said Sola, taking a few moments away from scooping ice cream to people lined up in front of his truck. Steady, heavy winds kicked up sand across the area, forcing onlookers to shield themselves with towels. Jessica Smith and Chester Jaheeb decided to brave the waters despite many warnings for people to stay out. Jaheeb, who was born in India but lives in Jacksonville, said he had never experienced a tropical storm before. "We were at a certain part that started pulling us out, like the rip current, so we decided to come to shore," said Smith, 17. Taylor Anderson, captain of Jacksonville Beach's American Red Cross Volunteer Lifesaving Corps., said his lifeguards went body-surfing early Sunday to get acclimated with the surf conditions for what looked to be a long day. They also reviewed methods to determine where there might be riptides. "They look for discoloration, the water moving paradoxically back to sea, and our lifeguards are trained to spot that, to keep people away from that, especially when the surf is this high. It makes those run-outs very dangerous. People can get sucked into those very fast, especially with the high surf and the high wind," he said. Though the weather was calm earlier Sunday, Anderson's lifeguards began preparing other equipment in the morning. They packed sandbags in front of the entrances to the oceanfront Red Cross lifeguard station and pulled lifeguard stands off the beach. As the winds picked up, officials hung two red flags, one warning of dangerous ocean conditions and the other notifying beachgoers that swimming was prohibited. But a lot of people ignored the warnings. By 3:30 p.m., Anderson said, lifeguards had made 150 "preventions," meaning lifeguards ordered 150 people out of the water, though no rescues were necessary. One of the people ordered out the water was Christian Siciliano, 14, of Jacksonville Beach. The surfer said the waves were too rough for surfing so he, his brother and a friend decided to go boogey-boarding. "We just went out to, like, mess around," Christian said. "It was really rough. I didn't make it out too far, about 10 feet." He said the waves were so powerful it was difficult to paddle against them. Then lifeguards raced to the area and ordered him and the two other youths from the water. Joe Murphy, a spokesman for the Ritz Carlton in Amelia Island, Fla., said he was not seeing a flood of checkouts or people trying to get off the island. Outdoor dining had been moved inside and the hotel set up movies and family game activities, but the hotel had no plans to board up or move patio furniture inside. Tropical storm warnings were in effect for the entire Georgia coastline, as well as parts of Florida and South Carolina. Once Beryl comes ashore, it was expected to continue dumping rain over parts of Florida and Georgia on Monday before heading north and then out to sea. It was expected to weaken to a tropical depression by Monday night. On Tybee Island, a barrier island not far from Savannah, water off the beaches was closed for swimming Sunday. Tybee Island fire Chief C.L. Sasser said winds of up to 42 mph were creating "horrendous water currents." Only people with flotation devices strapped or tethered to their bodies were being allowed into the water, and they were being cautioned not to venture in farther than knee deep. "Even if you're standing in waist-deep water, the current can sweep you out quickly," he said. His ocean rescue team pulled a total of 48 people from the water on Saturday, he said, including about 27 that were considered to be in life-threatening conditions. One man who was sucked under the water was rescued by friends and onlookers and was taken to the hospital in serious condition. A band of showers soaked the beaches late Sunday morning, causing crowds to thin, Sasser said. With alternating rainy and sunny weather forecast throughout the day, he said he expected the crowds on the sands to ebb and flow. In South Carolina, Janice Keith with the Myrtle Beach Area Convention and Visitors Bureau said Sunday that the office hadn't fielded any calls from concerned tourists. In Beaufort County, emergency management deputy director David Zeoli said officials were continuing to monitor the storm and encourage people to have a plan in case conditions get worse. Zeoli said winds had kicked up in the area that includes Hilton Head Island, a popular golf and beach destination. "It's just a wet day here," he said.